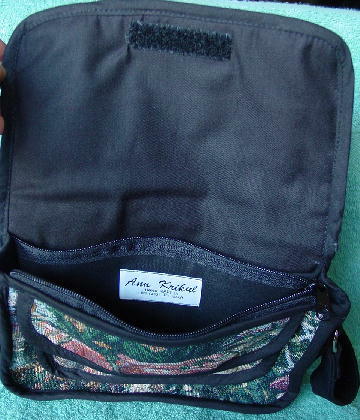 This Ann Krikul purse has a tag that says it was made in Los Angeles, USA. 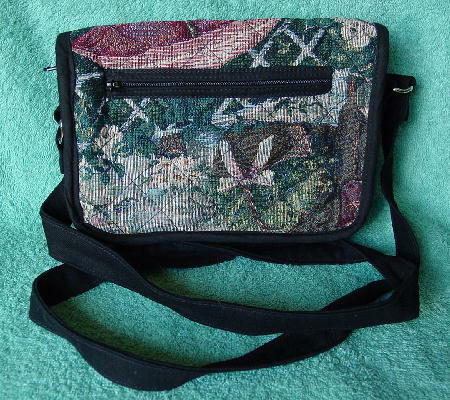 It has a black side and bottom base with the back, front flap, and front of the base, pocket, and lining in tapestry. The two flaps have black velcro closures. There is also a back zipper pocket. It has a 47 1/4" long by 1" wide black shoulder strap attached to the sides by a silver-tone metal loop. Under the flap is a side to side top zipper. 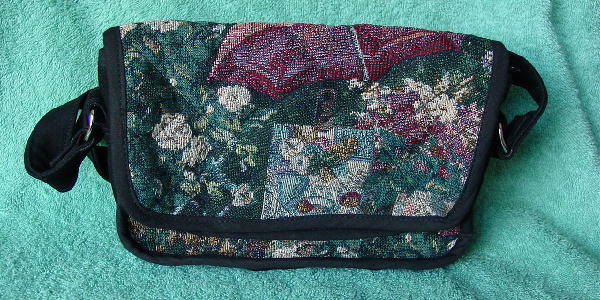 The tapestry has a black thread quilted pattern. It has a garden scene with flowers, a basket, an umbrella, a bench, etc. in white, red, baby blue, brown, teal green, forest green, and black, with a touch of maize threads. It's from a Los Angeles model. A client gave it to her as a gift.